Enjoy Cold-Brew Coffee at Home! At Next Stop Coffee Shop we use the Toddy Cold Brew process to deliver that smooth, flavorful coffee you have been enjoying these past few summers. Here is a great tutorial so you can brew great cold coffee at your home. Visit our Buy Coffee tab and explore all the wonderful coffees varieties Metropolis has to offer this summer! Buy your Toddy Cold Brew system from us and we'll buy your first bag of beans for you! Make Exceptional Coffee Using the Chemex Method! Here's a fun tutorial video posted by Intelligentsia (I know, I'm a Metropolis guy, but this is a really cool teaching video). It's okay to use the other guys teaching video, but you have to use Metropolis beans! 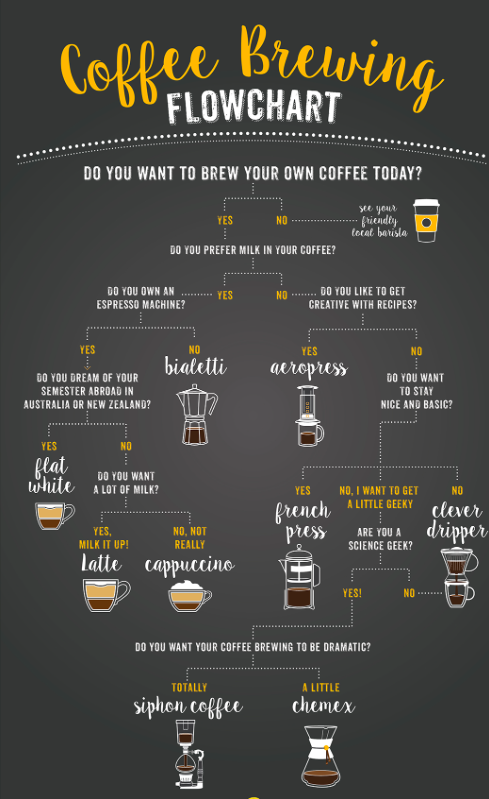 A Flow Chart To Help You Choose The Right Brewing Method.